The family of the Miami homeless man whose face was chewed off by a naked assailant Saturday thought he was dead for years, CBS Miami reports. "I tried to reach him, but I just thought he killed himself,” said Ronald Poppo's sister, Antoinette. Antoinette Poppo said the family hasn't heard from Ronald, 65, in 30 years. Details of his life after he attended New York's prestigious Stuyvesant High School in the 1960s remain scarce, traced in a string of mostly petty arrests, hospital records, and a call to the Miami-Dade Homeless Trust last week from the Jungle Island zoo, where Poppo had been sleeping on the roof of the parking garage. Vietnam veterans never got the homecoming many feel they deserved. On Monday, a group of veterans, the Department of Defense and others will begin the first of many ceremonies to honor those who served and commemorate the 50th anniversary of the start of the Vietnam War. Events will be planned over the next 13 years, concluding with the fall of Saigon. Many will gather Monday at the Vietnam Memorial Wall for a wreath ceremony, including President Obama. 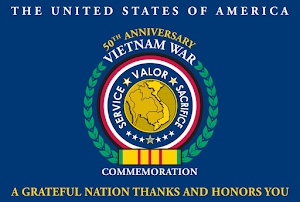 Today, Memorial Day, the government is beginning 13 years of events commemorating the 50th anniversary of America's involvement in the Vietnam War, from the early combat operations of 1962 to the fall of Saigon in 1975. Today is the first event. President Obama is joining the secretary of defense and other dignitaries at the Vietnam Veterans Memorial. They're expected to call on organizations ranging from veterans groups to corporations to help create events expressing gratitude to those who served in Vietnam. NPR's Allison Keyes reports. ALLISON KEYES, BYLINE: Air Force Master Sergeant Lloyd Chuning(ph) was nearly speechless as he stood in front of the Vietnam Veterans Memorial for the first time. MASTER SERGEANT LLOYD CHUNING: It comes home when you see all the names. KEYES: Chuning and his wife Valerie stood at the midpoint of the reflective black granite wall as workers set up for today's ceremony. He thinks it'll be a good public acknowledgement for his service in Vietnam in 1970 and '71. CHUNING: It's enough. It's a lot more than what was done in the past. Crystal City Hilton Hotel was taken over again by the Nam Knights! My husband and I missed it again this year so we were really happy to see this video. I hope we make it there next year because we sure do miss this huge gathering. STOW: The scene played out as if it were written in Hollywood. Sarah Razzaia was inside a restaurant near Joint Base Lewis-McChord in Tacoma, Wash. Jason Joseph Vargo, a soldier, was just home from his second tour in Iraq. They wound up at the same table. They started talking. That night, Vargo took her for a ride in his new VW GLI and while driving, it started to rain. The song For a Dancer by Jackson Browne came on his CD player. He asked her to dance — right there in the rain. A year later, in 2007, they were married. “Fate brought us together,” Sarah Vargo said Wednesday in her Stow apartment, surrounded by family, pictures of her husband, his medals and his uniform. A week ago, Jason Vargo, only 29, died of a heart attack. The Labor Department has identified 210 occupations in which unemployed veterans could find work after as little as one year of education and training through the new Veterans Retraining Assistance Program. But House staffers say there is reason to believe the list is not complete. The 210 occupations will be covered by a $1.6 billion program that gives veterans age 35 to 60 one year of additional education benefits to retrain into a field where they can get work. The House Veterans’ Affairs Committee staff, however, noticed that long-distance truck driving was not mentioned. Every year Baldwin Fairchild sponsors the Memorial Day Service at Glen Haven Memorial Park. This is one of the best things around for Memorial Day. The fallen from all wars are honored and so are the veterans. Winter Springs Jr. ROTC does a wonderful job with everything they participate in but it is easy to tell this service is very special to them. This is a video with the highlights of the service. Two singers stood out. One part of the Orlando Three sang God Bless The USA and Arnold Grace had delivered heart tugging Hero For Today. MONTGOMERY, Ala. (AP) - Seventeen veterans' service offices will close around the state, meaning ex-soldiers in some counties will have to travel to receive benefits or other assistance. The Alabama Department of Veterans Affairs says it closed the offices because of severe funding cuts to agencies funded by the state General Fund budget. Spokesman Robert Horton said Tuesday that no employees will lose jobs because manpower will be consolidated in the other offices. The purpose of the offices is to help eligible veterans apply for and receive claims, Horton said. He said if the outlook of the General Fund improves, some offices may reopen. Horton said the workload facing the veterans' offices is increasing because of so many soldiers retuning from Iraq and Afghanistan and the aging population of those who served in Vietnam, Korea and World War II. 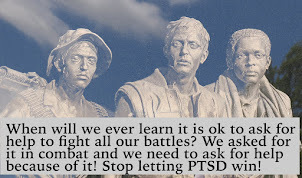 WWII veteran with PTSD says "We were taught to be quiet"
If you have watched Ken Burns documentary The War you understand that when veterans came home before Vietnam, this is what they were all told. "We were taught to be quiet." and that is exactly what they did. 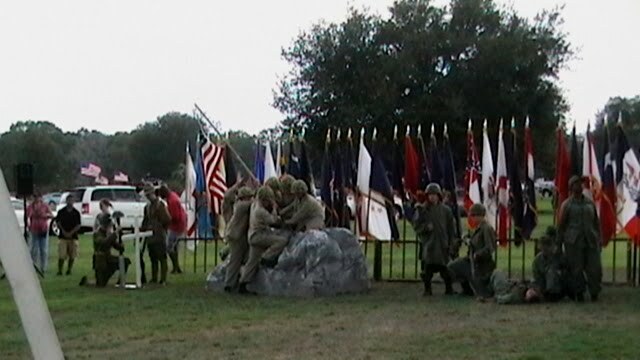 Vietnam veterans decided to do something about Combat PTSD. It is because of them we now have psychologists, mental health clinics, crisis responders along with over 40 years of research in trauma. It is not that they were the first to experience the residual effects of war, but they were the first to take a stand and have it acknowledged as a price they paid. Here's a story about a WWII veteran and what he has lived with all these years in silence. Ruben Ramirez earned a Bronze Star and three Purple Hearts as a World War II infantryman fighting Nazi troops in North Africa and Italy. 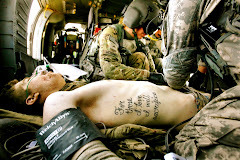 The physical wounds he sustained in combat eventually healed. Not so his emotional injuries. To this day, Ramirez, 86, a retired diesel mechanic and American Indian who traces his roots to the Apache nation, is tormented by recurrent nightmares of having witnessed his buddies being blown apart. He gets out of bed every few hours to patrol the perimeter of his house in Fresno. However, it was not until 2008, after a broken marriage, a spotty employment record and more than 60 years of suffering, that Ramirez, one of an estimated 2,000 American Indian military veterans living in the Central Valley, finally sought treatment. Ultimately, he was diagnosed with post-traumatic stress disorder and received disability from the U.S. Department of Veterans Affairs. "We were taught to be quiet," Ramirez said when asked to explain why it took him so long to seek counseling, which he continues to undergo weekly. 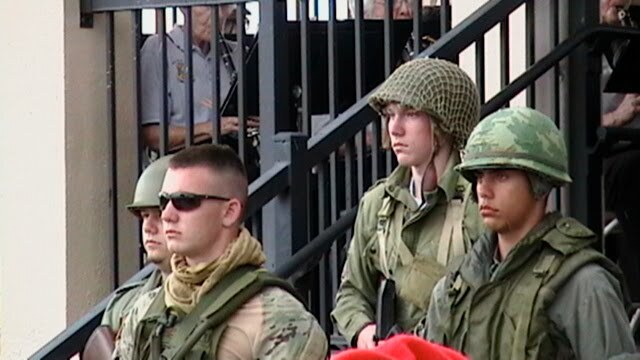 Missouri National Guard accused of looting after Joplin tornado? When I read the headline, I could feel my blood pressure go up. I thought about how this would look when National Guards showed up to help but a few decided to help themselves. But,"One man's trash, another man's treasure" seems to apply here. They were told the items would be destroyed anyway. I changed my mind as soon as I read the rest of the article. Do you think they should have been punished for this? ST. LOUIS - The Missouri National Guard, after initially refusing to divulge reports about suspected looting by soldiers after the Joplin tornado, publicly released them this week under orders from Gov. Jay Nixon. The investigative memos show that one day after a devastating tornado struck Joplin last year, four soldiers assigned to look for survivors pocketed video game equipment and a digital camera they found at a ruined Wal-Mart. The heavily redacted documents do not identify the soldiers involved in what the documents refer to as incidents of "theft," but the memos give the soldiers' ranks: one sergeant and three specialists. All the soldiers were demoted and had letters of reprimand placed in their personnel files, said Major Tammy Spicer, a spokeswoman for the Guard. The soldiers believed that the merchandise was going to be destroyed, according to a memo written by Captain Matthew J. Brown, who investigated the matter. A retired U.S. Marine drill sergeant has started a petition asking the Department of Veterans Affairs and Congress to provide medical care to the Camp Lejeune veterans poisoned by cancer-causing chemicals from 1957 to 1987. Sgt. Jerry Ensminger started a petition on Change.org asking Congress and the VA to provide necessary medical care to the 200,000 people who lived on Camp Lejeune during the thirty-year period in which the water was contaminated with cancer-causing human carcinogens. The petition currently has over 76,000 signatures. Ensminger lost his daughter, Janey, from childhood leukemia when she nine years old. He suspects the Camp Lejeune contaminated water is to blame. Ensminger isn't the only one. William Price, a former Marine who spent six years stationed on Camp Lejeune in the 1970s, filed a class action suit against the VA in December 2010. He currently suffers from liver and kidney disease. Photo by AMY BINKLEY Memorial Day 2012 A woman visits her fallen service member at the Coastal Carolina State Veterans Cemetary in Jacksonville, N.C., Monday. She sits alone on the grave, face downcast. Though her thoughts are unheard, the cries of her heart echo as loud as thunder. She has loved, and she has lost. Her solace is found among the stars and stripes marking the final resting place of hundreds of brave warriors and knowing she is not alone in her mourning or her memories. Service members, both past and present, their families and members of the community gathered to remember their fallen brothers during the annual Memorial Day ceremony at the Coastal Carolina State Veterans Cemetery in Jacksonville, N.C., Monday. “We all have our own reasons for coming today,” said Maj. Gen. Paul E. Lefebvre, commanding general of U.S. Marine Corps Special Operations Command. COLORADO SPRINGS, Colo. -- The relationship between man and his horse is a storied one. Winston Churchill once said, "There's something about the outside of a horse that is good for the inside of a man." The 19th century novelist Robert Smith Surtees said, "There is no secret so close as that between a rider and his horse." And the 20th century American novelist John Steinbeck said, "A man on a horse is spiritually as well as physically bigger than a man on foot." For hundreds of years, people have recognized the healing qualities of horses. Here, on the grounds of the U.S. Air Force Academy, equine specialists have taken those healing qualities to a whole new level with the equine assisted learning experience. As part of the Warrior Wellness Program, service members can participate in the program as a way to cope with their mental and physical injuries, especially those that are combat related. Although the bulk of the guests are Soldiers from the southern Colorado area, the program is open to service members from all branches. The stables are tucked away in a corner of the base that used to be a family housing area. Away from the space-themed structures on the main base, modern-day cowboys, clad in Stetsons and spurs, can be seen tending to the animals. And then there's Boris; the resident mule who thinks he's more akin to the family dog than a farm animal. "Once you cross the rock bridge, it's like a different world," said Robert Templin, an animal caretaker and equine specialist. "It's like taking a step back in time. There's the Rocky Mountains right there and the river - it's a goose bump giver." v The staff members at the equestrian center use their old-fashioned "cures" to help treat Soldiers who are dealing with an issue that plagues many service members who are returning from combat in today's conflicts. "I can tell you firsthand, these people save lives," said an Airman who participated in the program and asked to remain anonymous. " 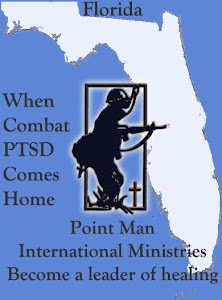 I know that sounds melodramatic, but make no mistake, Mr. Barrett and his team save Soldiers, Sailors, Marines, and Airmen from taking their own lives, and they allow military families an amazing venue to start healing together -- no doubt, no drama, no embellishment." When my kid brother left for Iraq he was just that — a kid. He returned home shattered inside. The “dark pit,” as he calls it, was hidden underneath his gruff, infantry-tattooed exterior. No one in our family could have predicted what he would experience or the after-effects that continue to haunt him today. 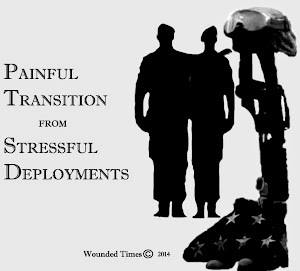 Many Sailors, Soldiers, Marines and Airmen return from deployments with Post Traumatic Stress Disorder. As a family member of a person suffering from PTSD, we must be strong for them in a variety of ways to help them combat the disorder. I received an up-close and personal look at how it can affect a person, when my younger brother came to live with me after separating from the U.S. Army. Shortly after graduating from the U. S. Army Infantry School at Fort Benning, Ga., my younger brother found his newly-issued boots on the sandy ground in Mosul, Iraq — during a time that would turn out to be one of the bloodiest during the war. His main duties were to provide infantry support to convoys, security detail, and to locate and apprehend insurgents. He came home with an inescapable burden on his back. He continually woke up, drenched in sweat, with nightmares so real he could still see the terrifying images in his dark room. 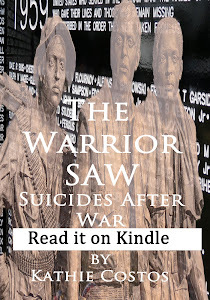 His mind was filled with the lives he had to take, the friends he lost — some to the enemy, some to suicide — and the near-misses of death’s cold, bony grip on his own neck. Reminder: Don't forget about the spouse! My husband is 100% disabled and cannot work. I can work but have not been able to find a job under Veterans' Preference. (I do this blog for free) While it was wonderful I was able to go back to college and get certification in Digital Media with help from the VA, I'll still have student loans to pay back. When I am lucky enough to get an interview in Digital Media and mention this to them, they have no idea what I'm talking about. If you are a spouse or Mom you need to know this. Derived Preference is a method where you, as the spouse, widow/widower, or mother of a veteran may be eligible to claim veterans' preference when your veteran is unable to use it. You will be given XP Preference (10 points) in appointment if you meet the eligibility criteria. Both a mother and a spouse (including widow or widower) may be entitled to preference on the basis of the same veteran's service if they both meet the requirements. However, neither may receive preference if the veteran is living and is qualified for Federal employment. NOTE: The derived preference for spouses is different than the preference the Department of Defense is required by law to extend to spouses of active duty members in filling its civilian positions. For more information on that program, contact your local Department of Defense personnel office. Spouses are eligible when your veteran has a service-connected disability and has been unable to qualify for any position in the civil service. Widows/Widowers are eligible if you did not divorce your veteran spouse, have not remarried, or the remarriage was annulled, and the veteran: served during a war or during the period April 28, 1952, through July 1, 1955, or in a campaign or expedition for which a campaign medal has been authorized; OR died while on active duty that included service described immediately above under conditions that would not have been the basis for other than an honorable or general discharge. Mothers of deceased veterans veterans are eligible when your son or daughter died under honorable conditions while on active duty during a war or in a campaign or expedition for which a campaign medal has been authorized. 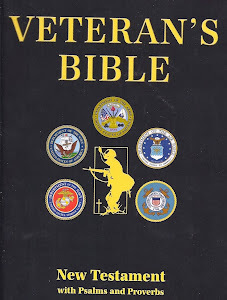 Additionally, you must: be or have been married to the father of your veteran; AND live with a permanently disabled husband; OR be widowed, divorced, or separated from the veteran's father and have not remarried; OR if remarried be widowed, divorced, or legally separated from your husband at the time you claim derived preference. 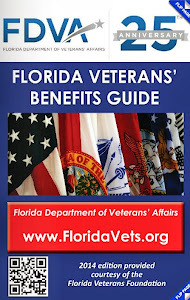 Mothers of disabled veterans are eligible if your son or daughter was separated with an honorable or general discharge from active duty, including training service in the Reserves or National Guard, and is permanently and totally disabled from a service-connected injury or illness. 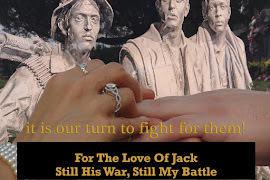 Additionally, you must: be or have been married to the father of your veteran; AND live with a permanently disabled husband; OR be widowed, divorced, or separated from the veteran's father and have not remarried; OR if remarried, be widowed, divorced, or legally separated from your husband at the time you claim derived preference. NOTE: Preference is not given to widows or mothers of deceased veterans who qualify for preference under 5 U.S.C. 2108 (1) (B), (C) or (2). 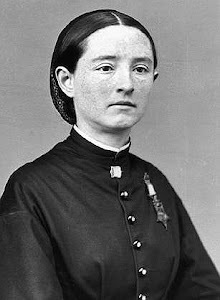 Thus, widows or mothers of deceased disabled veterans who served after 1955, but did not serve in a war, campaign, or expedition, would not be entitled to claim preference. Military Spouse Preference is a Department of Defense program applicable to positions being filled both in the continental United States and at overseas locations. For more information contact you local Department of Defense personnel office. If you are looking for a job, print this from the link above and take it on your interview. Military veterans face a major communications gap when looking for jobs in the civilian world. That’s what a survey from Monster.com, one of the world’s leading job sites, found when it took a deeper look at how veterans fare in the job market once they leave military service. On Wednesday, Monster released the Veterans Talent Index, a report based on surveys of veterans looking for work and of the employers who are seeking to hire them. This is the second index the company has done; Monster plans to revisit the project every six months or so. “We created the VTI to shine a light on the problems that vets are having in finding jobs,” said Steve Cooker, Monster’s executive vice president and head of global government solutions. Veterans’ confidence in being able to find a job is dropping, the study found, as they face a tough job market. The unemployment rate is particularly high for 18- to 24-year-old veterans, said Jeff Quinn, Monster Worldwide’s vice president of global insights. They are finding it tough to compete for scarce jobs against peers who have not served in the military but instead have a few years of additional education or work experience under their belts. Cooker said the problem will only get larger as government budget cuts prompt more people look for jobs outside of the military. Altavista, VA- An inspiring update on a soldier from Altavista, nearly killed in Afghanistan. Chris Walker was clearing a site of explosive devices when one went off, throwing him 30 feet. He lost both of his lower arms, and a leg. Right now, he's at Walter Reed Memorial Hospital in Maryland. We got to speak with him. He's been through so much, but he's very optimistic. He's not mad, he's not upset, he's not even worrying about the future. The only thing he is complaining about, is having to stay in bed. And from the looks of things, he won't be there long. Chris Walker's mother remembers it like it was yesterday. "I can't explain. I really can't explain the feeling that it, that you have when you get the call," said Donna Hammack, Chris' Mother. The call that her son lost three limbs, and was clinging to life. "It's nothing that I'd wish on nobody else," said Hammack. CRANSTON, R.I. (WPRI) - People have been allowed back into their homes in a Cranston neighborhood after being evacuated during an hours-long standoff Wednesday night. Police said a 30-year-old veteran suffering from post-traumatic stress disorder was behind the incident. Police responded to a home on Legion Way around 7 p.m. after being alerted by the man's family. "He has had some issues in the past, and I'm happy to say he's going to a place where he's going to get the help he needs and all of our officers are going home safe," said Col. Polombo. Englewood Police Officer Jeremy Bitner died from injuries he received when he was hit by an alleged drunk driver in the early-morning hours of Memorial Day. Bitner served a tour in the Army as a member of the 101st Airborne Infantry and served a tour in Bosnia. He became a law enforcement officer and was a deputy with the Elbert County Sheriff’s Office before being hired by Englewood in December 2004. In his time as an Englewood police officer, Bitner served as a member of the Special Weapons and Tactics team, was a field training officer for newly hired officers and was an instructor in the Citizen’s Academy. Using an American war veteran as the face of their cause, two South Florida congressmen called on the governor Tuesday to immediately stop the state’s purge of the voter rolls. And in a separate move, Florida Democratic Sen. Bill Nelson sent a letter to the governor expressing his own concerns about the voter purging. U.S. Rep. Ted Deutch, D-Boca Raton, and U.S. Rep. Alcee Hastings, D-Miramar, accused the Republican governor of using the roll cleanup as a ruse to disenfranchise voters just months before a presidential election. Substance abuse. Violence. Even thoughts of suicide. These are some of the problems that many veterans returning home from the wars in Iraq and Afghanistan are struggling with. Today it's called post-traumatic stress disorder, or PTSD, but it has affected veterans going back much farther. While doctors and researchers put enormous efforts into developing new treatments, one group of veterans in Salt Lake City is finding relief in a very old tradition: a Native American sweat lodge. If you didn't know to peer over the six-foot brick wall next to a parking lot at Salt Lake's Veterans Affairs center, you'd never guess it was there. On a Friday afternoon, Cal Bench, a Vietnam veteran, is here early, gathering firewood like he does every week for the ceremony that will start in a few hours. "I went into the service at 18 and I went to Vietnam at 19," Bench says. "And I had no idea how it would change or affect you mentally. The concept that I would carry that around forever was just hard. But I just never had any place to turn. I came here and I was given a blessing." What does Chris Hayes think a hero is? Chris Hayes doesn't seem to understand what makes someone a hero. "Doing his job" a person puts on his /her uniform because they are very different from people like Hayes. A hero is a regular person who rises about being ordinary. We use the word for regular people putting their own lives on the line for the sake of someone else, yet they live the same way the rest of us do the rest of the time. Same hopes, dreams and problems but they managed somehow to show the rest of us how very different they are. We have some making it their careers to save lives. They go into law enforcement knowing they could be killed in the line of duty as well as usually being the last person you want to see unless you need them. Firefighters and EMT responders know they could also die in the line of duty but people are happy when they show up simply because they only show up when you need them. Even in these groups there are some going above and beyond what is expected of them, above the ordinary for their class. We call them all heroes but the difference comes when they call one of their own hero. It looks like there is a heated debate going on about who is a hero. Overheard on CNN.com: Does the uniform make the hero? When a soldier puts on his uniform for the first time, has he joined the ranks of our nation’s heroes? Or is he simply doing his job? 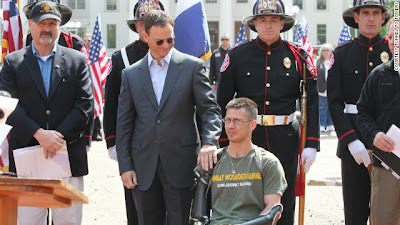 MSNBC’s Chris Hayes chose Memorial Day to share his opinion that military service alone does not a hero make – an opinion he quickly rescinded and publicly apologized for amid a barrage of criticism. While many thought the newsman was out of line, others supported him as simply exercising his rights to tell an uncomfortable truth. It all depends on who is using the word. 2. a person who, in the opinion of others, has heroic qualities or has performed a heroic act and is regarded as a model or ideal: He was a local hero when he saved the drowning child. 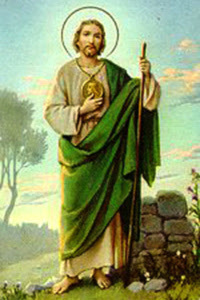 3. the principal male character in a story, play, film, etc. b. (in the Homeric period) a warrior-chieftain of special strength, courage, or ability. c.(in later antiquity) an immortal being; demigod. Medals are given because someone higher up in the military thinks the serviceman or woman deserves it. Calling someone a hero is determined by the person using the word. To me, anyone putting their own lives, wants, desires and needs aside for someone else is a hero. As with everything else, there are different levels of heroic acts but in the end they are very different from the rest of us. U.S. Marine turned country singer Stephen Cochran nearly took his own life after returning home from war four years ago. Through the message in his new song, "Pieces", Cochran hopes to help other veterans going through the same thing. The lyrics of the song demonstrate the struggles veterans' face with post traumatic stress disorder. "We hope to touch the people out there and save some lives. If we save two or three people, that's two or three people that wouldn't be here before this message," said Cochran, who left his music career to fight overseas but got injured in Afghanistan. "I was paralyzed from the waist down," he continued. "They told me I've never walk again I thought this dream that I had would never happen." When he returned home, Cochran suffered from posttraumatic stress disorder and was on the brink of suicide. MONTEREY PARK - Authorities today offered a $20,000 reward for information that leads to the conviction of whoever killed an Army sergeant outside his brother's home in Lancaster. Sheriff Lee Baca held a news conference to appeal to the public for help in solving the murder of 26-year-old Nathen Taylor, who served three tours of duty with the 101st Airborne Division in Iraq and Afghanistan. "The idea of solving a homicide case is one where all possibilities have to be considered," Baca said. Taylor had just left a party at his brother's home in the 700 block of West Avenue H-7 and was shot while sitting in his car about 12:10 a.m. His brother, Patrick, heard the gunshots and ran out to find brother fatally shot. Nathen Taylor, who had been in the Army for seven years, had been taking computer and engineering classes at Antelope Valley College. 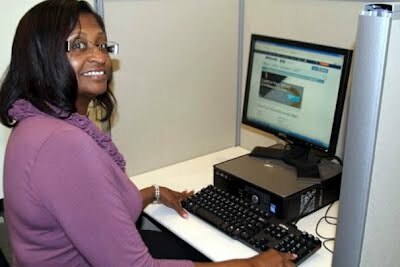 U.S. Department of Labor - Cheryl Blackburn, an Army veteran, had previously held jobs in customer service and as a security contractor, but is also unemployed. 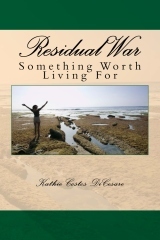 She recently signed up for the Veteran Retraining Assistance Program. For Cheryl Blackburn, an Army veteran who lost her job as a leasing consultant in March, the search for new employment has been frustrating. Blackburn, 51, of Southeast, is one of the first veterans in the country to sign up for a new program offered jointly by the Department of Veterans Affairs and the Labor Department aimed at retraining up to 99,000 older veterans for high-demand jobs. The program, known as the Veteran Retraining Assistance Program (VRAP), targets unemployed veterans between the ages of 35 and 60. The program is a key part of the VOW to Hire Heroes Act passed by Congress and signed by President Obama late last year. Blackburn hopes to use the program to earn a degree in finance at the University of the District of Columbia or Northern Virginia Community College. “This important tool will help those who served our country receive the education and training they need to find meaningful employment in a high-demand field,” Veterans Affairs Secretary Eric K. Shinseki said upon the program’s May 15 launch. 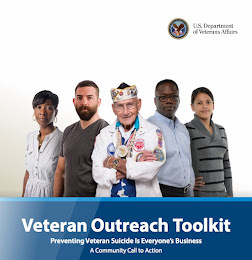 AUSTIN – As the nation reflects this Memorial Day on the men and women who served our country both past and present, there is also a growing focus on an alarming number of military suicides with the present generation of U.S. Veterans. Floyd credits strong family support and the support of his veteran family at the V.F.W. Post 8787 in North Austin for helping him reacclimate back in to society. That hasn’t been the case for every veteran. “Actually, I just found out that on Mother's Day one of my former troops committed suicide. He was having martial issues,” added Floyd. “They're doing three, four and five tours. Where in Vietnam, unless you really wanted to, I would say the maximum tour, I would say a maximum of two years,” said P.K. Wright, a Vietnam Veteran who spoke to KVUE News Monday. Veterans Stick With the Republican Nominee, but why? This is something I can never understand. Why do veterans do this to themselves? John McCain is supported by veterans even though his history of votes has been against them. President Obama has done a lot for veterans, but they don't support him. Why? If they look up the facts they would know what they have been told is not always true then maybe they'd have a lot more than either side has given them. Case in point is "strong military" but their votes (on both sides) actually mean strong on defense contractors and not the troops or veterans. Everyone in Washington is trying to get re-elected, so they want to bring defense money to their own area of the country but they don't seem to be all that interested in veterans. Do they have claims processed correctly and on time? Do they have a place to live? Do they have jobs? Do they have support services from their communities? Do their families have what they need when troops are deployed? Do National Guards and Reservists have the ability to keep healthcare insurance when they are back home, especially when they don't have jobs to go back to? Do they get support from the colleges, have their GI Bill funds move the way they are supposed to? There are so many issues regarding veterans and what they need after they served but no one seems to be really paying attention to them. President Obama never served, and neither did Mitt Romney. For the first time since World War II, neither presidential nominee is a military veteran. But polling suggests that veterans still have a strong preference for the Republican candidate. In 2008, military veterans strongly backed Senator John McCain for president. In fact, Mr. McCain’s huge advantage among veterans largely fueled his majority support from men in general. Mr. McCain, who was a naval aviator during the Vietnam War and spent more than five years as a prisoner of war, received 57 percent of the votes of male veterans while Barack Obama won 42 percent. Among men who had not served in the military, 52 percent backed Mr. Obama and 46 percent preferred Mr. McCain, according to the Edison/Mitofsky national exit poll. This year, according to analysis of the Gallup daily tracking poll, voters who have served in the military strongly support Mr. Romney, the presumptive Republican nominee, over Mr. Obama, 58 percent to 34 percent. Nonveterans back Mr. Obama, 48 percent to 44 percent. UPDATE no shocker here! Another reporter decided to take the work of someone else as their own. First a play on my headline and then a change of words for the original report from NY Times. Mitt Romney leads Obama among veterans, but why? Just 24 of our 44 presidents served in the U.S. Armed Forces before taking office, suggesting Americans are not necessarily opposed to picking presidents without military experience. But the upcoming contest between President Obama and Mitt Romney is unique in recent history: the first such race since World War II in which voters won't have a veteran to vote for from either major party. The National Vietnam War Museum in Orlando Florida had their annual Memorial Day Service. 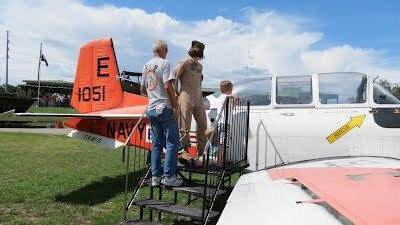 Major Amy Rittenbusch came to cut the ribbon of the plane she flew. The following was an email report Harry Scholer sent out about the day. Folks, Yesterday I attended the Vietnam and all Veterans Memorial Day service at the Bunker and it was truly memorable. A thirty year marine colonel with 50 plus air combat missions, a thirty two year old army lieutenant who holds a purple heat and a bronze star, and congresswoman Sandy Adams, a true conservative and veterans supporter were on the dais.. Each spoke briefly and from the heart about the true meaning of Memorial Day. The VFW band played patriotic music, the 5 joint services color guards presented colors and the names of the fallen Vietnam veterans from Orange County were read out loud as young marines placed wreaths at the wall. A soaking rain did not stop the attendees from paying their respects. One of those present stood out to me. He was an old man wearing old clothes and his face and arms were scarred from cancer removal with a laser. He had tobacco juice staining the corner of his mouth and a baseball cap that said "Veteran of three Wars, WWII, Korea and Vietnam. Maybe if you saw him on a bus you would turn away. I shook his hand and said something like what a career, his response was " I guess I was a slow learner." As we talked he told he retired from the Marine Corps as a Master Sergeant. As a teenager he was at Bougainville and Okinawa, a twenty something at the Frozen Chosin and in his words an old man in Vietnam (he had retired in 1964 and was called back to active duty in '68. It was there that he and other troops were sprayed with agent orange.) From his perspective Vietnam was the worst if he had to pick one, not like the other two were a cakewalk. Most of us revere veterans from all wars but it is rare to meet one who served in three. He said he was driving by and saw all the cars so he decided to stop in. I'm happy that he did. Please remember all who served this day and everyday. After Eugene Ovsishcher returned from a nine-month combat tour in Afghanistan, he experienced what his doctors called symptoms of post-traumatic stress: nightmares, flashbacks and a pervasive anxiety. A psychiatrist advised him to get a dog, and last August he did — a shaggy, mocha Shih Tzu puppy that Mr. Ovsishcher named Mickey because he crawled like a mouse. The dog proved to be the right medicine, Mr. Ovsishcher said: Mickey woke him from nightmares by sensing something was wrong and barking, settled him down when he was alone and anxious, and even checked up on him “like a registered nurse” when he had a fever. But now Mr. Ovsishcher is facing eviction from his three-bedroom co-op at Trump Village in Coney Island, Brooklyn, because the housing complex has a no-dogs policy. He is wrestling with a kind of Sophie’s Choice: his home or his dog. This is what happens when people do not pay attention. When troops were sent into Afghanistan, there were less doctors and nurses working for the VA than during the Gulf War. When wounded were coming back from Afghanistan and the push was on to get Vietnam veterans to file claims for PTSD and Agent Orange by service groups, more troops were sent into Iraq. 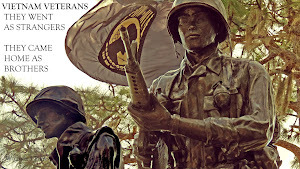 No one thought about the veterans from any wars. What did voters do? Nothing. They did not hold their politicians accountable. 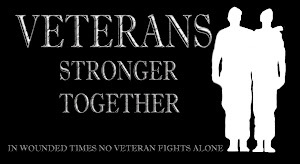 It didn't matter if they were Republican or Democrat, Independent or didn't vote at all, veterans should always be a national issue since this nation sends them from every part of this country. If you want to really say you honor the fallen then we better do a better job of taking care of the living. NEW ORLEANS -- The men and women veterans coming home from Iraq and Afghanistan are filing for disability benefits at the highest rate in U.S. history. Forty-five percent are seeking claims. That's double the rate from the Gulf War in the 1990s. At Monday's Memorial Day gatherings, wounded veterans of the past talked about their experience with getting benefits. People in the packed Fleet Reserve Association hall in Gretna stood to salute the flag and sing the Star-Spangled Banner. These veterans came home a generation or two ago with unforgettable experiences. "We were being shot at when a Viet Cong with an M79 grenade launcher, and it is frightful when you hear those things coming in, and there was an explosion. I didn't know where I was," said James Tompson. He is a marine and a Vietnam veteran who was awarded the Purple Heart when his arm was injured. Four years ago he filed for disability benefits for a brain condition. He is still waiting. 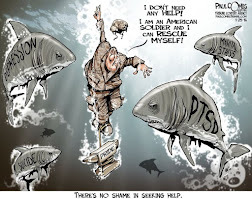 "Especially when it comes to PTSD (Post Traumatic Stress Disorder) and either anything, it seems to be taking an awfully long time for the VA to sort it out," said Tompson. Why do I spend so many hours tracking stories across the country? Because the big boy media companies don't seem to care enough to do it. Wounded Times does it again! It took Associated Press all this time to pick up on this story but Wounded Times had it posted back in February. This happens all the time. Because veterans and the troops are all that is posted here, you get the stories first. How about you email them and ask them what took so long to report this. Fallen Marine Sgt. William Stacey's last letter, "it was all worth it" This is what makes them so different from the rest of us. This last letter to Sgt. Stacey's family tells them that for all the talk for and against what he was doing, he believed he was making a difference in this world. He didn't serve to do anything other than do some good for someone. We can talk about everything else but in the end, this is what it all comes down to. They are willing to die for each other, surrender whatever comforts they have at home to travel around the world but once they do, most of the country moves on, forgetting about them. Here's the AP story or you can click the link above for the way it was first reported. Fallen Marine's letter marks Memorial Day in Kabul U.S. Marine Sgt. William Stacey was killed earlier this year by a homemade bomb in southern Afghanistan, a tragedy for which he prepared by writing a letter to his family explaining why he was fighting that was to be read in the event of his death. NATO officials said two coalition members were killed in a helicopter crash in eastern Afghanistan Monday. The coalition said it is investigating the cause of the crash. Initial reports said there was no enemy activity in the area. Earlier, another coalition aircraft also crashed in eastern Afghanistan. There were no fatalities in that crash. Also Monday, an insurgent attack in southern Afghanistan killed a NATO service member. NORTH TEXAS (CBS 11 NEWS) – The memories of the battles he fought in Iraq came home, to Fairview, with Corporal Gregory Schneider. It was the long, confidential conversations he had with his father that helped Schneider rise above the darkness that overwhelmed him after his return from battle in Iraq. Schneider died at home on Memorial Day in 2010. He was killed in a motorcycle accident that happened when he tried to get onto I-75 Central Expressway at Haskell, in Dallas. 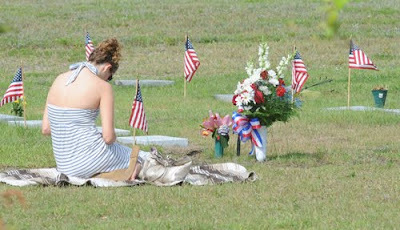 Just one day before the crash the Schneider family had gotten together for lunch, to recognize Memorial Day. Now two years later, before today’s memorial service at DFW National Cemetery in Dallas, Schneider’s parents visited his grave and talked to CBS 11 News about their son’s accomplishments and challenges trying to overcome Post Traumatic Stress Disorder (PTSD). Today, all across America, we’re coming together to remember our men and women in uniform who gave their lives so that we could live free. In town squares and national cemeteries, in moments of quiet reflection and parades down city streets, we’ll pay tribute to all those who gave the last full measure of their devotion, from Lexington and Concord to Iraq and Afghanistan. This Memorial Day also holds special significance because it marks the beginning of the 50th anniversary of the Vietnam War. It was 50 years ago — January 1962 — when U.S. Army pilots on dozens of helicopters transported South Vietnamese troops into the jungles outside Saigon for a raid against enemy forces. It was one of America’s first major operations in Vietnam and another turning point in what would become one of our longest wars. Today at the Vietnam Veterans Memorial in Washington, D.C., I’ll join Vietnam veterans and their families for a ceremony to begin this 50th anniversary. It will be an occasion to honor the 58,282 names on The Wall—men and women who gave their lives in that war. We’ll stand with their families, who have borne that loss ever since. And we’ll reaffirm our commitment to never stop searching for the 1,666 service members who are still missing from that war. After Vietnam, our veterans didn’t always receive the respect and thanks they deserved. At times they were neglected and even shunned, which was a national shame. We’ve pledged many times since Vietnam that we would never let that happen again, and that we would give our veterans, especially our Vietnam Veterans, the respect and honor they deserve. This 50th anniversary is our opportunity to do it right. This is what happened to Medal Of Honor Hero, Vietnam Veteran, Sammy Davis. He was beaten up at the airport after he saved lives in Vietnam. 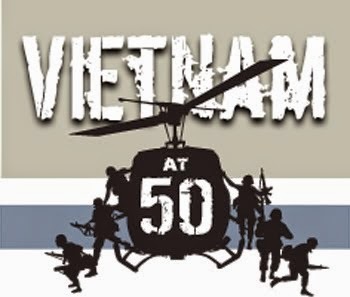 It was 50 years ago in January that the U.S. began to provide helicopter support to the South Vietnamese. That action grew into a 13-year conflict that took more than 58,000 American lives." Under bright, hazy skies at Arlington National Cemetery, President Obama spent his fourth Memorial Day as commander in chief honoring the hundreds of thousands of soldiers who died serving their country, particularly in the Vietnam War, which began more than 50 years ago. “From the jungles of Vietnam to the mountains of Afghanistan, they stepped forward and answered the call,” Obama told hundreds gathered in the humid, midday heat at the cemetery, which is across the Potomac River from the capital. Heeding to custom, Obama also laid a wreath at the Tomb of the Unknown Soldier, pausing to reflect and pray as a lone bugler played taps. That declaration drew applause, as did his pronouncement that “we are winding down the war in Afghanistan and our troops will continue to come home. “After a decade under the dark cloud of war, we can see the light of a new day on the horizon,” Obama said, pointing out that we need to remember not only the fallen but their families too. “As a country, all of us can and should ask ourselves how we can help you shoulder a burden that nobody should have to bear alone,” he said. On New Year's Eve 2010, Lt. Larkin O'Hern was leading an infantry platoon of the 101st Airborne Division, clearing a Taliban compound in southern Afghanistan when a cache of explosives detonated. The blast blew off O'Hern's left leg completely and shredded his right leg and arm. As darkness fell over the village of Howz-e-Madad, the only question appeared to be whether O'Hern — bleeding profusely — would be the final U.S. death in Afghanistan of 2010, or the first of 2011. In fact, O'Hern would survive — a tribute to the advances in American military medicine, to the skill of medics and medevac teams, and to his own fortitude. When I met him last May, the triple amputee had just stood up for the first time on prosthetic limbs after more than four months of surgeries at Brooke Army Medical Center and grueling rehabilitation at the Center for the Intrepid. At the time, the West Point graduate had set a goal of flying to Fort Campbell, Ky., to greet his returning battalion — standing. Twelve months later, I visited with O'Hern again. He was walking — with a cane, but nonetheless walking, and carrying a backpack. Did he make it to Fort Campbell? The story of Leon Cooper's -- World War II veteran and American original -- return to "Red Beach". Cooper, a veteran of the battle of "Bloody Tarawa," returned to Tarawa in February 2008 in order to learn more about reports he had read about garbage on the fabled "Red Beach." In November 1943, Leon, a US Navy landing craft officer, helped launch the first major amphibious assault on a Central Pacific Japanese stronghold. 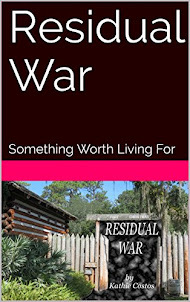 Leon is dismayed to discover that this hallowed ground is strewn with garbage rotting in the sun, a painful insult to the sacrifice his fellow marines made for their country, during one of the bloodiest three-day battles in American war history. Cooper's trip is full of wonder, anger, amazement and divine providence as he and film maker Steven C. Barber visit what Leon suspects to be the graves of hundreds of Marines still buried on Tarawa. Follow Leon Cooper's trip back in time, as narrated by Oscar-nominated actor, Ed Harris. A story of redemption and passion that will move you to tears. 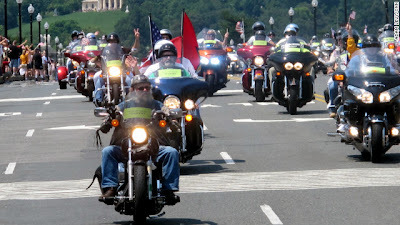 Robert Bergdahl's message to his son: "Stay strong, never give up"
Washington (CNN) -- The parents of missing U.S. serviceman Bowe Bergdahl led the Rolling Thunder ride in Washington on Sunday, trailed by the roar of what was estimated to be hundreds of thousands of motorcycles. 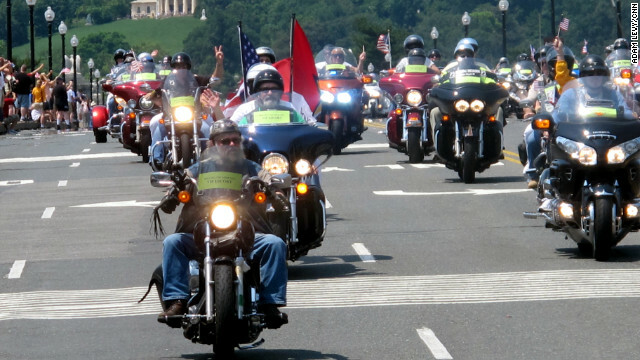 The annual Memorial Day weekend ride, now in its 25th year, is held in remembrance of prisoners of war and those missing in action. Bergdahl, a 26-year-old army sergeant, was captured in Afghanistan in 2009 after he finished his guard shift at a combat outpost in southeastern Paktika province. (CNN) -- Moments after the explosion, as he lay in a canal in rural Afghanistan, Cpl. Todd Nicely screamed twice at the top of his lungs. He was hurt so badly, his right leg blown away, his left one barely hanging on, but then he thought of two things. His wife and his men. He didn't think of dying. He wanted to concentrate on getting home, and before that, he didn't want his squad's last image to be its leader wailing in pain. "I just [told myself] keep breathing, keep breathing. If you do that you'll make it back to your wife," he said recently by phone. "I knew I was injured. It was whether I could bring myself to remain calm and not freak out and cause my vitals to go crazy." What Nicely, who had stepped on the pressure plate of a roadside bomb, didn't realize at the time was that he had lost more than his legs. His arms also would need to be amputated. In another war, another time, Nicely would have died on the battlefield. Truth be told, there's a strong chance his heart did stop at some point on that day in March 2011. But thanks to modern body armor and a helicopter that arrived in just six minutes -- as well as quick reactions by his fellow Marines -- Nicely lived and became just the second quadruple amputee to survive battlefield injury wounds. They are a small group, the quadruple amputee combat vets -- just five of them. There are also 40 triple amputees. 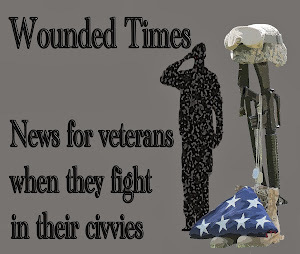 When they come home, they have their own set of issues, but many face the problems of every wounded vet. They start their new lives together. For the family and friends of service members who died by suicide, Memorial Day can be not only a solemn day, but also a painful reminder that military suicides are not treated the same as combat deaths. Kim Ruocco, the national director of suicide education and outreach at Tragedy Assistance Program for Survivors, or TAPS, has experienced this isolating grief firsthand. This weekend, she is bringing together about 100 suicide survivors at TAPS' annual Memorial Day weekend National Military Survivor Seminar and Good Grief Camp for Young Survivors. "[Suicide survivors] are surrounded by people whose loved ones were killed in action," Ruocco said. "There's a real sense that their loved one's death was not an honorable death." 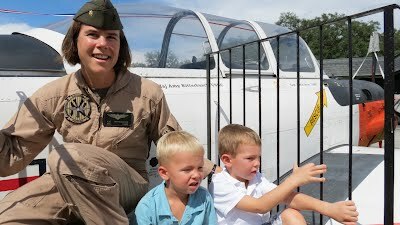 Ruocco's husband, Marine Corps Maj. John Ruocco, killed himself seven years ago. He was a Cobra helicopter pilot who ran 75 combat missions during a five-month deployment in Fallujah, Iraq, in 2004. He had struggled with depression in the past, particularly after a training accident in the 1990s when two Cobras collided in midair, and he lost four friends. In February 2005, while living temporarily in a hotel room near Camp Pendleton in California, awaiting a redeployment to Iraq and considering mental health counseling, John Ruocco hanged himself. Army Lt. Col. Tom Tosten led troops during stints in the deserts of Iraq and Afghanistan, but the toughest battle he's had to fight was at home as he transitioned back into civilian life after four deployments over his military career. 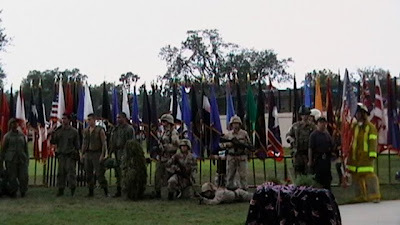 Tosten's tours of duty included eight months in Desert Storm during the Persian Gulf War in the early 1990s followed by six months in Somalia in 1994. His most recent tours were 15 months in Iraq followed by another to Afghanistan. His tour in Afghanistan was cut short after four months when Army officials decided to send him home for treatment for post traumatic stress disorder. That's a decision that haunted him for months as he felt responsible for the well-being of the men and women in the Marines under his command and didn't want to leave them. MODESTO – Inmates with serious mental illnesses deemed incompetent to stand trial are languishing in California jail cells for months as they wait for state hospital beds to open up, according to advocates, jail officials and family members. State and county budget cuts to mental health programs are combining with prison realignment and a shrinking number of state hospital beds to exacerbate the problem, they say. In many counties, seriously mentally ill inmates routinely wait three to six months in jail before a state hospital bed opens up, said Randall Hagar, director of government affairs for the California Psychiatric Association. He calls the situation, which he says has gotten worse in recent years, "tragic." Building a connection could be a challenge for the new chief after a recent, high-profile deputy-involved shooting of a Camp Pendleton Marine sergeant at San Clemente High School. SAN CLEMENTE – In 1986, John Coppock was a young officer starting his career in what was then the San Clemente Police Department. He was eager to go out and "crush crime." Twenty-six years later, Coppock is a lieutenant in the Orange County Sheriff's Department and oversees its operations in San Clemente, making him the de facto chief of police in the city where he grew up and spent most of his teenage summers on the beaches. Coppock now has 35 deputies under his command. He said he tells the younger ones he doesn't just want them to crush crime but also to get out of their patrol cars and build a bond with members of the oceanfront community. But making that connection could be a challenge for the new chief after a deputy's recent shooting of a Camp Pendleton Marine sergeant at San Clemente High School. The shooting generated big headlines, a lawsuit from the Marine's family and a crisis of confidence among some residents who asked the City Council to terminate its contract with the Sheriff's Department and bring back the San Clemente Police Department. Others spoke out about what they said is a history of heavy-handedness by local deputies. Sometimes even outlaws prefer peace and quiet. 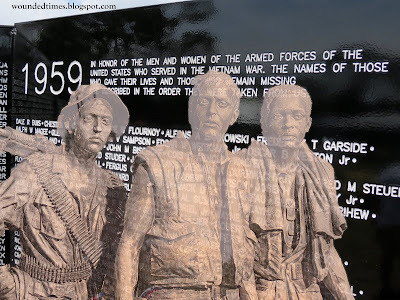 Among the groups of people who stood guard over the Illinois Vietnam Veterans Memorial at Springfield’s Oak Ridge Cemetery on May 5-6 was the Springfield chapter of the Outlaws Motorcycle Club, part of an international group. The Outlaws were among members of different organizations participating in the 24-hour vigil who say they prefer to walk the memorial when, typically, nobody is looking. Between 10 p.m. and 11 p.m. on May 5, the Outlaws patrolled the 24th annual vigil to honor the 2,938 Illinois servicemen who died in the Vietnam War. Members also patrolled the World War II and Korean War memorials. Mike O’Neal, one of about a dozen Outlaws at the Memorial, said the late-night shift is the perfect time to reflect. It’s quiet, peaceful and there are not a lot of distractions, he said. The effort to win the votes of military veterans in the presidential election takes the spotlight Memorial Day weekend, with President Obama and Mitt Romney each attending public events and arguing he has a better plan to improve veterans' weak unemployment situation and other issues. Romney is scheduled to appear Monday with Arizona GOP Sen. John McCain at a Veterans Museum and Memorial Center in San Diego, a conservative region and so-called Navy town. McCain, a decorated Navy officer and Vietnam prisoner, won the veteran vote over Obama as the Republican nominee in the 2008 election. The GOP has long been considered the party that supports a strong national defense and holds the vote of veterans and active-duty members. But the percentages are dropping and the vote appears to be up for grabs this year. President George W. Bush won the veteran vote by 16 percentage points in his 2004 race against Democrat and Vietnam veteran Sen. John Kerry. McCain won in 2008 against Obama, though only by 10 percent, 54 percent to 45 percent. DENVER — Sandy Dahl, who channeled the tragedy of her husband's death on Sept. 11, 2001, into a powerful campaign to honor his memory, has died. Dahl, 52, apparently passed away in her sleep, said family friend David Dosch. Dahl's husband, Jason, was the captain of United Flight 93 on 9/11. She strongly believed Jason fought alongside passengers to keep terrorists from crashing the plane into the U.S. Capitol or the White House. The plane instead crashed into a field in rural Pennsylvania. The couple lived in the Denver-area dream home Jason was renovating. Sandy moved out following the Sept. 11 attacks, but continued to live in Colorado. After Jason's death, Dahl became a public face for all grieving 9/11 families. 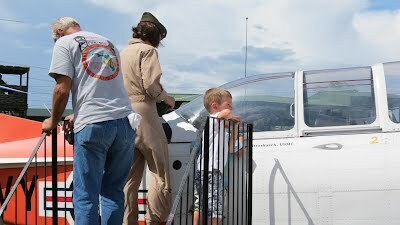 She founded a scholarship in Jason's honor to provide funding for young pilots to receive their education. And she gradually warmed to public speaking, to make sure the heroism of Jason and many others aboard Flight 93 was not forgotten. (CNN) -- Thank you for your service. We say those words more frequently now -- when we see men and women in uniform at the airport, when we accept a paper poppy from a veteran at the supermarket, when we sit next to a member of the military at a ballgame. It's a nice gesture, true, but small. We say it, but then most of us go back to the rest of our lives. It's a volunteer military these days, after all; we don't have to serve, and we don't have to remember. So we don't have to think about the bitter cold of the Ardennes in the Battle of the Bulge. We don't have to think about the steaming, confused jungles of the Vietnam War, a war whose 50th anniversary is now being commemorated. We don't have to think about IEDs, and up-armored Humvees, and downed helicopters. We don't have to think about the sacrifices. But we must. 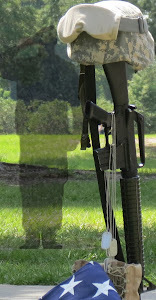 Editor’s note: CNN.com writer Moni Basu is author of “Chaplain Turner's War,” published by Agate Digital. Army chaplain Darren Turner, left, wound up quitting the Army for a spell after returning home from Iraq. Atlanta, Georgia (CNN) - Darren Turner insisted on going to war, even though the Army usually reserves desk jobs at home for new chaplains like him. Turner was young and green, enthusiastic about taking God to the battlefield. The Army captain had learned that people in pain are often wide-open to inviting God into their lives. Jesus always ran to crises. Turner was going to do the same. He’d enrolled in seminary in 2004 at Regent University in Virginia, founded by evangelist Pat Robertson. And early in his spiritual journey, he was inspired by Christian writer John Eldredge, who suggests that American men have abandoned the stuff of heroic dreams, aided by a Christianity that tells them to be "nice guys." God, says Eldredge, designed men to be daring, even dangerous. 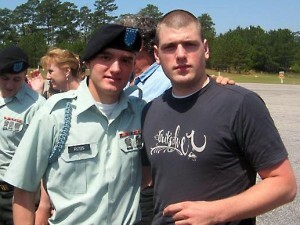 Turner arrived in Iraq in May 2007 with the 1st Battalion, 30th Infantry Regiment amid a raging insurgency. His soldiers faced an invisible but lethal enemy in booby-trapped houses and roads laced with massive bombs. Congressman Ryan do you know what Resiliency Training is? Awakened America host Marshall Stern was interviewing Congressman Ryan on his show. Ryan was talking about PTSD and Resiliency Training as if it was a good thing. Does Ryan have any idea what this training has been doing to the troops? Does he have a clue it tells them PTSD hit them because they didn't train right and are weak minded? That is the message they have been given when Battlemind first came out. I am sure it was not intended to deliver the message this way but when they are told they can train their minds to be tough, that is the message they hear. Don't take my word on this. The hard data speaks for itself. 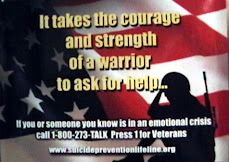 Rise in military suicides and attempted suicides along with veterans and it proves it does not work. Tim Ryan is a relentless advocate for working families in Ohio's 17th District. He was first elected to the U.S. House of Representatives in 2002 and was sworn in on January 7, 2003. Successfully reelected four times, he is currently serving in his fifth term. Ryan currently serves as a member of the House Armed Services Committee with jurisdiction over national defense policy, ongoing military operations, the organization and reform of the Department of Defense, counter-drug programs, acquisition and industrial base policy, and technology transfer and export controls. He serves on the Subcommittee on Emerging Threats and Capabilities and the Subcommittee on Readiness. In addition to the numerous manufacturers in Ohio that supply products and equipment for national defense, the Committee oversees the operations of the Youngstown Warren Air Reserve Station, the 910th Airlift Wing, the former Ravenna Arsenal, and the Ohio National Guard's Camp Ravenna Joint Military Training Center. (CBS News) Speaking to military families who endured the anguish of losing a loved one, Vice President Joe Biden today recalled the car accident that took the lives of his wife and one-year-old daughter in 1972. In a tone both measured and thoughtful, Biden described receiving the unthinkable news: "And just like you guys know by the tone of a phone call, you just knew didn't you?," he told the audience. 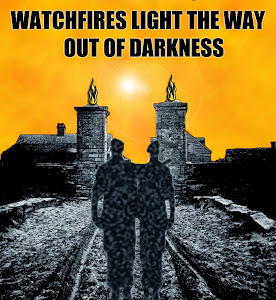 "You knew when they walked up the path, you knew when the call came, you knew. You just felt it in your bones. Something bad happened. And I knew. I don't know how I knew. But the call said my wife is dead, my daughter was dead, and wasn't sure how my sons were going to make it." Biden's first wife, Neilia, and his daughter Naomi were Christmas shopping with sons Beau and Hunter on December 18, when a tractor trailer fatally broadsided their station wagon. The critically injured boys went on to make full recoveries. The vice president drew knowing laughter as he described the daily trials of grief. "I knew people meant well, they'd come up to me and say 'Joe, I know how you feel. I knew they meant well, I knew they were genuine, but you knew they didn't have any damn idea, right? Isn't that true?" The military is investigating the death of a Marine from Burlington found dead in his barracks at Fort George G. Meade, Md. on Wednesday afternoon. Pvt. Anthony Romanocaruso, 19, had been attending Defense Information School since Feb. 22, said Col. Sean Gibson, public affairs officer of the Marine Corps Combat Development Command. Gibson released Romanocaruso’s name Friday morning. A news release sent Thursday said the Marine had been found dead in his barracks room Wednesday, and Fort Meade Fire and Emergency teams responded to the call. Romanocaruso was pronounced dead at the scene. NASCAR driver Brad Keselowski's foundation helps those who have served the U.S.
(CNN) -- Brad Keselowski is once again a contender in this year's NASCAR Sprint Cup Series, but off the track he is championing a cause dear to his heart. Keselowski, known for hanging an American flag out his window whenever a victory lap is warranted, started the Checkered Flag Foundation to support anyone who has "sacrificed greatly for America." The foundation centers around the Race 2 Recovery program, which serves wounded veterans. Several race weekends a year Keselowski and his foundation, run by former Navy Lt. Andrea Ross, work with local Veterans Affairs hospitals to bring vets and their families to the track for a VIP experience. Reuters Pictures of the week should have been the story of the week on cable news considering when our soldiers do something wrong, they all jump on the story. Take a look at this picture and read the story behind it. This is really remarkable considering how many of our soldier have been killed by Afghan police officers while being trained by US forces. Think about Captain Kelvington having so much compassion for Dostager that he fell to his knees to honor the loss. 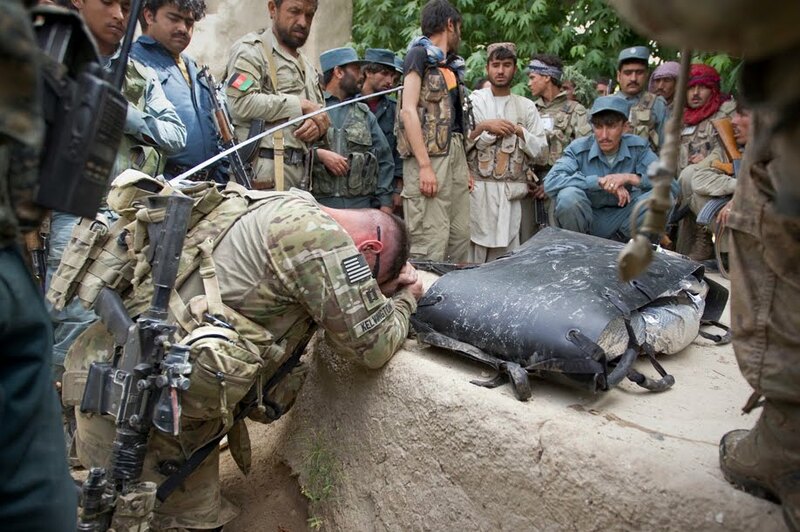 I couldn't find a full story on this but when you look at the faces of the Afghans standing near the memorial, it is easy to understand how much this meant to them. How many other times does a US soldier honor the loss of Afghans fighting for their own country but no one bothers to report it? SHEFFIELD VILLAGE — It’s been a long time coming but well worth the wait. More than 40 years after serving in the Vietnam War, retired U.S. Army Master Sgt. Raymond Hatch will be presented with 11 medals earned for exemplary service in the war, including a Bronze Star and a Purple Heart. Today, in a special ceremony in Cleveland, U.S. Sen. Sherrod Brown will present Hatch, a Sheffield Village resident, with various medals such as the Bronze Star, Purple Heart, Army Commendation, National Defense Service, Vietnam Campaign, Parachute Badge, Sharpshooter M-14, Army Good Conduct, Republic of Vietnam Gallantry Cross with Palm Unit Citation, the Republic of Vietnam Civil Actions Honor Medal First Class Unit Citation and the Vietnam Service Medal with four Bronze Service Stars. Reminder, this is yet one more study about something that was known back in the 80's but passed off as something "new" and different. 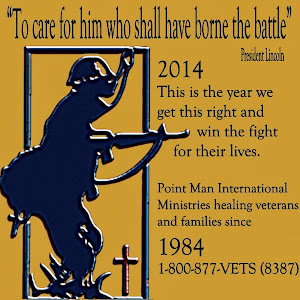 Point Man Ministries has been working with veterans and their families since 1984! A recent study has found that treating the families of veterans with Post Traumatic Stress Disorder for the psychological stress that comes with living with a vet with PTSD increases the success rate of treatment for the Veteran as well. A young charity, Military with PTSD, has already been addressing the problems caregivers are facing for the past two years and has taken a unique approach to spreading awareness. One of the major complaints from caregivers is that they have no one to turn to and no real help. They become exhausted and display symptoms of Secondary Trauma Stress, or Secondary PTSD. The new study put forth from the University of Syracuse's Institute for Veterans and Military Families suggests that treating the family members for their STS will make the living environment better for veterans and increase the chances of success in treatment. From the study abstract: Research has identified PTSD as mediating the effect of veterans’ combat experience on the family. Veterans’ numbing/arousal symptoms are especially predictive of family distress; while, to a lesser extent, veterans’ anger is also associated with troubled family relationships and secondary traumatization among family members. Empirical modeling of additional factors involved in secondary traumatization is needed. Marital/family interventions have largely focused on improving relationships and reducing veterans’ symptoms, rather than targeting improvements in the psychological well-being of the spouse and children. Interventions directly addressing the needs of significant others, especially spouses, are advocated. The potential for increased effectiveness of PTSD interventions and possible cost-savings attained by improving relationships and reducing caregiver burden are also discussed. PORTLAND, Ore. -- A former Marine is coming forward with a painful secret. An 80-year-old Portland woman says she was raped during her military service — and has been fighting ever since for the veterans benefits she says she deserves.